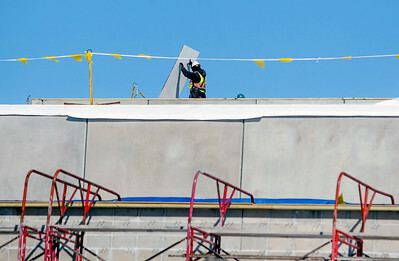 Sarah Nader- snader@shawmedia.com Construction crews work on the roof of the new $8.5 million auditorium at Cary-Grove High School Thursday, February 5, 2015. The construction on the project started last summer as is expected to finish by the start of the 2015-16 school year. The new auditorium will maintain the current 650-person capacity but include needed upgrades for accessibility, lighting and audio, lobby space and backstage areas. 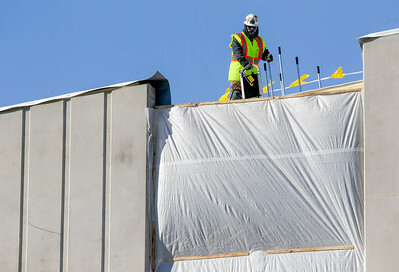 Construction crews work on the roof of the new $8.5 million auditorium at Cary-Grove High School Thursday, February 5, 2015. The construction on the project started last summer as is expected to finish by the start of the 2015-16 school year. The new auditorium will maintain the current 650-person capacity but include needed upgrades for accessibility, lighting and audio, lobby space and backstage areas.